It is with a far-reaching arm that I call on you all for some much needed help. Myself and my wife recently moved into the family farmhouse, following the death of my Father In-Law a number of years ago. As part of the sale, we became the proud owners of much my in-law family bone china trinkets, artefacts, and models. Much of these we hold very close to our hearts, and enjoy on almost a daily basis. My wife is a big collector of Nao, Wedgewood, Royal Doulton and has a 50+ collection of Peter Rabbit. Our guest room is awash with lovely figurines and cute trinkets, etc. I myself do not claim to have a vast knowledge of such items, although do absorb and appreciate the Royal Doulton immensely, and from time to time do chuckle at the comic aspect surrounding some of the characters from the Peter Rabbit collection. That said, I have recently been careless when washing the windows inside, and knocked a trinket onto the floor. 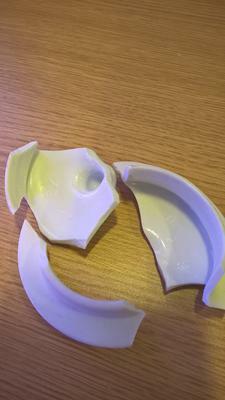 The base itself survived, although the lid did not, which met with the top of the radiator, and came off in a worse state. I do know that this item was one of my wife’s fondest, as it used to take pride of place in her Gran's kitchen unit, and was always on display when my wife was a child. She clearly remembers this in position on her Gran’s dresser unit, and also actually remembers nearly knocking it over herself one day (little does she know)! It may not be of any great monetary value, although this is not really the issue, whereas pride of ownership is the issue and sentiment is most definitely paramount. as there are no markings on the trinket. 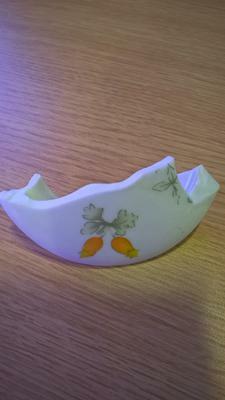 I have attached some photos, so really hope someone can help by advising me who the manufacturer may be, which would then allow me to search the web for a replacement. I am wholly sure that my Wife would understand, and would probably say something like “Granny will be watching from up high, and she won’t be happy”, but sure she will be saying so with a sharp almost awkward grin. This is the kind of woman she was, sharp to the point, but strategic in approach, a beautiful woman for sure. I do apologise if I am invading on the wrong web site, although I would greatly appreciate some help with this, if not only to (selfishly) make me feel better, but more so to ensure I can maintain the trinket. Some may say “If you replace the lid, it won’t be the same item”. Yes, I have thought about this, although I would probably own-up to the deed if I could find a replacement. In fact, I would definitely own-up, as I fear I could not keep a secret from my closest and dearest for much longer. It’s almost like a great 10 ton medallion hanging round my neck, which I really do want to shed, believe me! I have searched a number of web site, including ebay, for item which look cosmetically the same, but nothing has turned up, and I do really want the exact manufactured type. Thank you all very much in advance, and as I say, I really do hope I am not offending anyone with this request. I assure you that I have not taken the decision to use the web site easily, and have tossed the thought over and over for some time now, but I would be grateful, very grateful. Thanks. 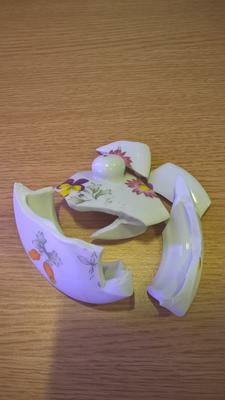 Perhaps you could get this put together again by a china restorer? It might cost quite a lot to have this done, but at least you would have the original back together again.